Happy Halloween! As promised, here is the big reveal of Trevor's Halloween costume! It's not a perfect match to the inspiration minifig, but pretty darn close! Trevor opted not to wear yellow face paint or a mustache, even though we'd done a trial run with both and they looked good. These pictures were taken just before a church event last night, so it's still possible that he'll choose to do the face paint and mustache for trick-or-treating tonight. We had a lot of fun putting the costume together. Trevor already owned the black pants and striped shirt. We cut a triangle from a scrap of red fabric to make his bandana. I sacrificed one of my old belts (that I haven't worn in 15+ years) and used the Crop-A-Dile to punch a hole so that it would fit Trevor perfectly. We made oversize keys out of chipboard that we cut and painted silver, then strung them through rope that we draped across him. We made the mask from craft foam and black elastic. The only things we purchased were the yellow gloves and the grey hat, which should get plenty of use during the winter. Not only was this costume very inexpensive and fun to make, but Trevor loves it. He can't stop smiling when he's dressed up. Check out these pictures I took of him sneaking around like a robber, hiding in the bushes, putting his hands up, and preparing to get handcuffed. Cutest robber ever, even without the mustache. 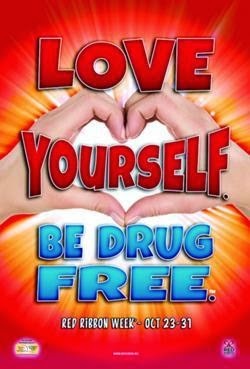 It's Red Ribbon Week here in the United States. Red Ribbon Week is an annual event to teach kids about the importance of staying drug-free. Tuesday was Sports Day ("Team up against drugs!"). That's an easy one - Trevor has numerous San Francisco Giants shirts, hats, sweatbands, etc. from Junior Giants. About 50% of the school was in Giants gear, so he fit right in. Yesterday was Camo Day ("Hide yourself from drugs!"). Trevor doesn't own any camouflage-print clothing, so he came up with a brilliant alternative. He dressed in a plain tan shirt and tan pants, brought a roll of Scotch tape with him, and picked up fall leaves and taped them to himself as we walked to school. Here he is with the first few leaves. The bell rang as we were taping the last leaves to him, so I wasn't able to take a picture of him covered with leaves. He got tons of compliments on his outfit. He's really excited to wear it to school. It'll be fun to see if there are any other programmers or engineers amongst the expected firefighters, doctors and nurses, soldiers, police officers, and professional athletes. Tomorrow is Hawaiian Day ("Take a life-long vacation from drugs!"). Trevor has many Hawaiian shirts and plastic leis, so that will be an easy one. Of course, he'll be changing out of that outfit and getting into his robber minifig costume as soon as he's home from school. It's adorable and we had a lot of fun putting it together. I'll show you tomorrow. Today is my nephew Timothy's 14th birthday. Like most teenagers, all he really wants is money. I get great pleasure out of messing with him, which is why I gave him a "knitting kit" last Christmas that was actually hiding money. I couldn't have been happier with his reaction. It was awesome. We celebrated his birthday on Saturday during the Pumpkin Party, so I was able to give him his gift then. He loves pineapple, but there was definitely some confusion on his face when I handed this to him. He obviously didn't believe that our family would be giving him a single $1.25 can of crushed pineapple for his birthday. He clearly didn't trust me (and my gleeful cackling didn't help). He cautiously pulled the tab on the top of the can, pointing it at me just in case. Inside were coins, pieces of candy, and rolled up bills. He was completely impressed and spent quite some time looking carefully at the can to figure out how I got the items inside a seemingly-intact can. To make your own, start by removing the BOTTOM of a pop-top can, using a safe-cut can opener (ours is by Chefmate). Carefully pour the food into a different container. Rinse the empty can thoroughly, making sure not to saturate the label. 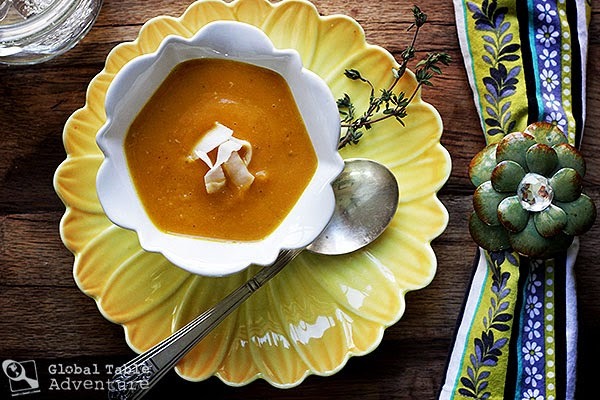 I intentionally chose pineapple both because Timothy loves it and because it would come out of the can cleanly (unlike condensed soup, for example, that could get caught in the ridges of the can). When the can is clean, let it dry thoroughly. Roll up dollar bills and insert them vertically into the can. Add candies, such as Smarties and Tootsie Rolls, that will also fit vertically. 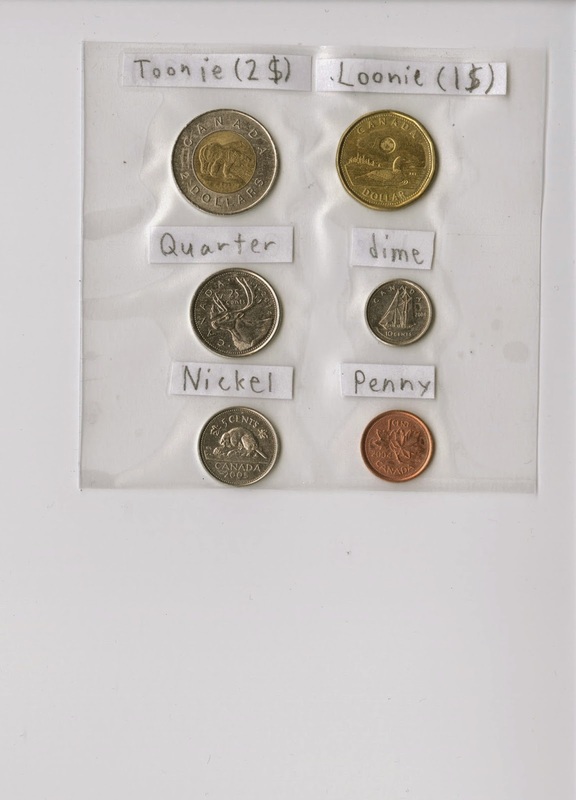 Add handfuls of coins to fill in all the spaces. If you pack it tight enough, the coins won't rattle around and give away the secret of what's hidden inside too soon. Use a strong craft glue to reattach the bottom of the can. I used Martha Stewart Glittering Glue, which worked perfectly. Let the glue dry overnight. 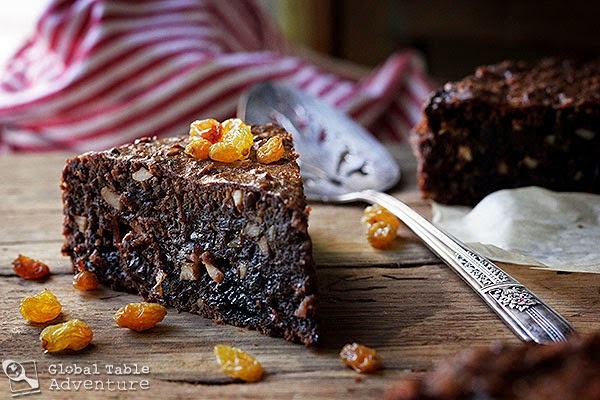 Gently turn the can right-side-up and add a gift bow to the top. Then give your gift to someone special and do some gleeful cackling of your own. Last weekend, we went to my sister's house for the (Sort Of) Annual Pumpkin Party, which is always a ton of fun. This year, there was no required object, but all our designs had to fit the Disney theme. We could carve as a family group (which we did) or as individuals (which everyone else did). It was a joint effort. I cut off the top, Trevor and I pulled out most of the guts, Steve cleaned it thoroughly, Trevor sketched the face, then I carved the face, painted silver on the teeth, and made an eyepatch from craft foam. We all worked together to arrange the props. It was fun to work together; last year, Steve was on a business trip and missed out on carving with Trevor and me. It turns out we weren't the only ones to do a Pirates of the Caribbean theme. My dad carved this awesome ship. More than once, he and I have come up with similar concepts or designs for the Pumpkin Party. My sister made a Dole Whip. It's filled with pineapple ice cream. My brother-in-law made Dumbo (who is apparently a Giants fan). The winner (as determined by each one of us grading every entry on a scale of 1-10) was my nephew's version of Tuck and Roll from A Bug's Life! As the party was ending, we discussed several possibilities for next year's theme, including another Disney theme, anything animation-related (which could include Disney), and animals (which could also include Disney). We won't know which of these, if any, is chosen until next year's party is scheduled. 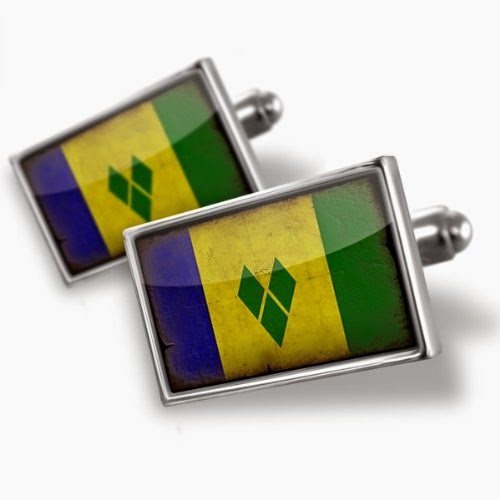 Welcome to the Virtual 25th Reunion of the 1989 California delegation to the Model Organization of American States, representing St. Vincent and the Grenadines! Peter, Michael, Ron, Piper, Colleen, Sabrina, Michelle... this is for you. Can you believe it has been 25 years? Some of you I have been blessed to have in my life all that time. Others I have had the pleasure of reconnecting with recently through the magic of the Internet. I tried really hard but wasn't able to find John. I hope he will somehow stumble on this. While I wish it were possible for us to reconnect for an in-person, life has taken us in so many directions and to different continents. We have families, jobs, responsibilities and other obligations that make it hard to meet in person. I thought a virtual reunion would be the next best thing. 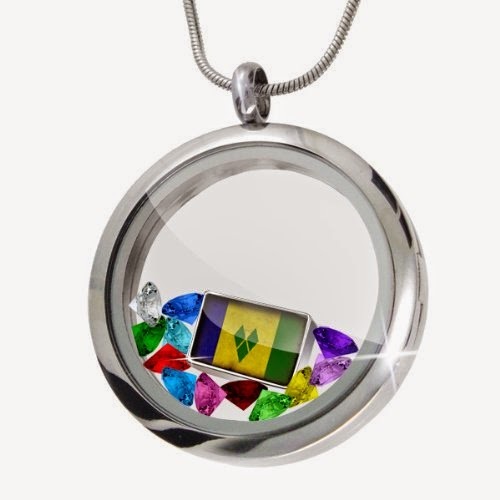 I chose today for our virtual reunion because October 27 marks the 35th anniversary of the independence of St. Vincent and the Grenadines. This country brought us together, so it only seems appropriate to celebrate on this special day. Our experience with the Model OAS was life-changing. There is no experience that I've had, either before or since, that matched the intensity of that trip. I've never learned as much in a single week or connected so deeply with anyone else in such a short amount of time. I am truly grateful for the experience. Before beginning the reunion, I want to thank the adults who made it all possible. Our parents, of course, were incredibly supportive. They brought us to meetings all over the state, gave up their phones for our frequent conference calls, and sympathized each time another 20-pound package of study materials arrived. Our local leaders supported us every step of the way. Generous donors made our travel possible. Our chaperone, Carol, gave 100% to the team and was simply incredible. But none of this would have been possible without one woman. Luella Zamzow hand-picked our team, trained us, and made us a success. She was a force. Luella passed away several years ago, which was a great loss to all who knew her. It's not an exaggeration to say that in my 42 years no person outside my family has had a greater influence on me than Luella did. She is dearly missed. Now on to the reunion! 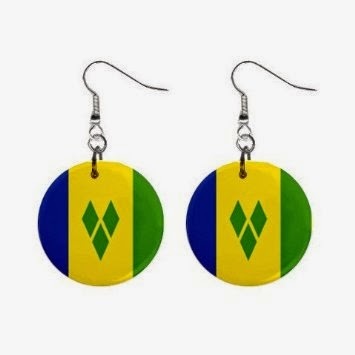 Please rise for the National Anthem of St. Vincent and the Grenadines! Every great reunion has favors. The beauty of having a Virtual Reunion is that there are no pesky budgetary limitations! 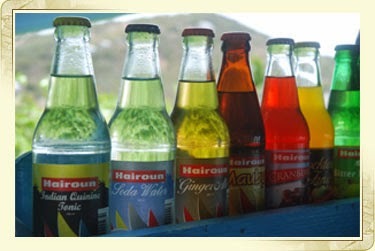 So, please accept these virtual gifts from me. 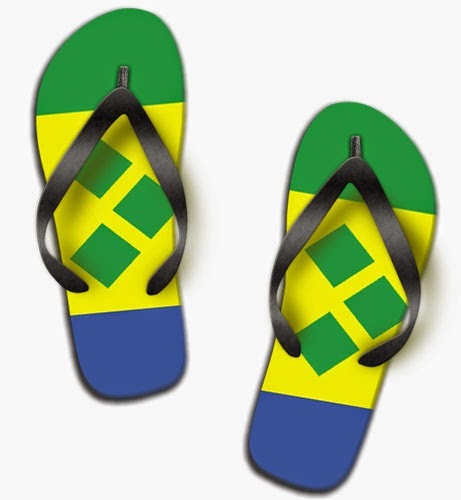 ... and flip flops for everyone! All the while, we'll share our favorite memories from the trip. We'll reflect on where life has taken us and what role 4-H and this trip has had in our adventures and journeys. Mostly, we'll laugh and remember the amazing times we had together, 25 years ago. 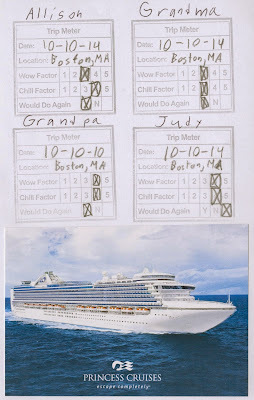 On Saturday 10/11, we had a scheduled sea day. It was supposed to have been the only sea day of the 10-day cruise, but weather conditions had prevented us from visiting two scheduled ports. 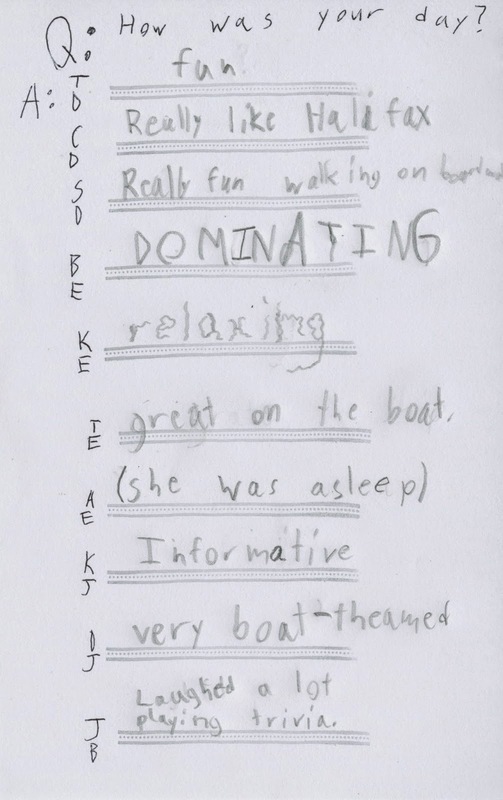 We enjoyed the relaxing day and took advantage of all sorts of shipboard activities. A highlight was watching my nephew Timothy compete in an egg drop competition. 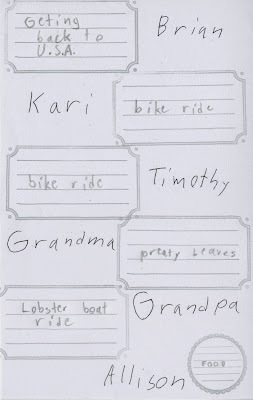 That night at dinner, Trevor asked everyone in our group to name their top 5 favorite things from the trip. It was very hard to pick just five! We went to so many interesting and beautiful places and learned so much. We ate great food and had lots of fun. 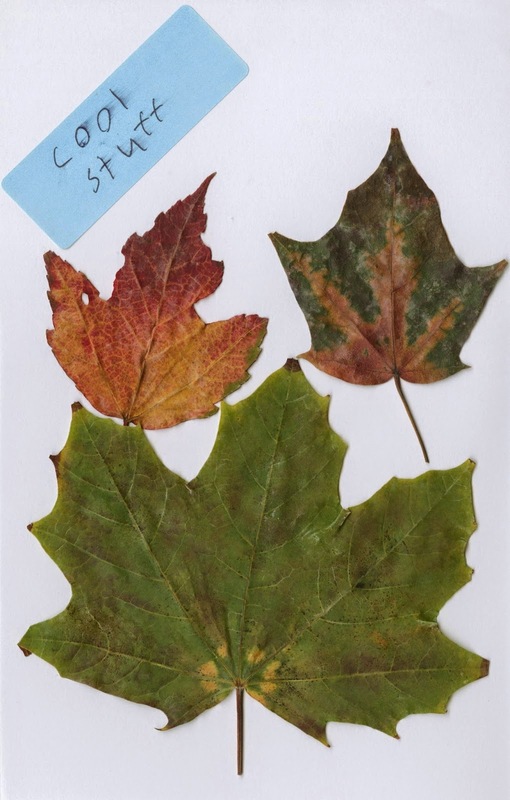 I ended up listing the fall colors, Eckhart in the City scavenger hunt, Acadia National Park, Toronto, and Quebec City as my top 5, but there are at least 10 other things I could easily have substituted for any of those. This truly was a wonderful trip. It was great fun to compare what each person had said they were looking forward to on Day 1 with the actual highlights they listed on Day 15. We sailed into New York Harbor at sunrise on Sunday 10/12. The Statue of Liberty has never looked so beautiful. And our view of the New York skyline with the new World Trade Center couldn't have been better. We got off the ship at 9:00 am and took a shuttle to the Newark airport. After a 6 hour flight, a tense 30 minutes of searching for a missing piece of luggage, waiting for a shuttle, and an hour-long drive (interrupted with Trevor announcing he might throw up, which fortunately he did not), we were finally home. 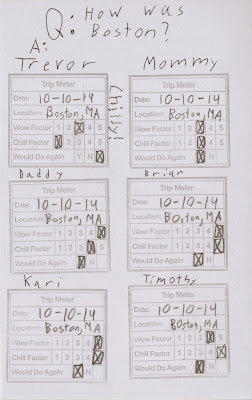 As Trevor wrote in his journal, "This wasn't a fun day, but the whole trip was very fun." 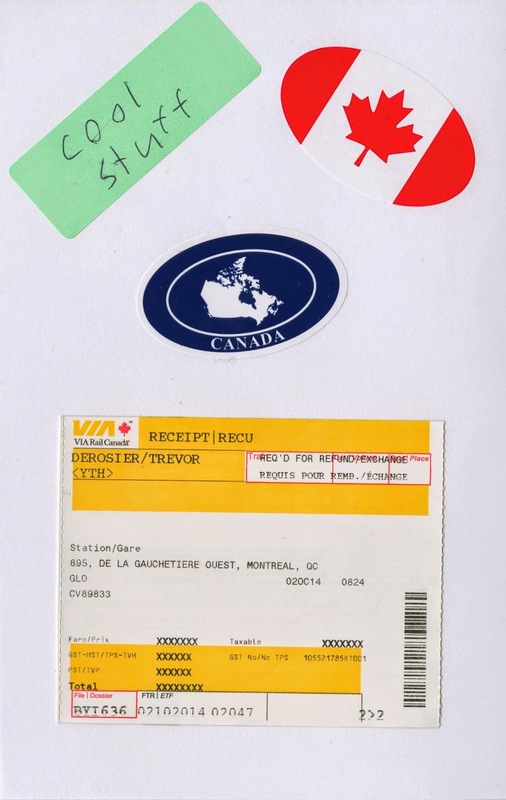 Here's a look at some of the "Cool Stuff" Trevor put in his Travel Binder. We gave Trevor $80 to spend during our 16-day trip. All souvenirs, snacks, or extra activities he wanted would come out of that budget. 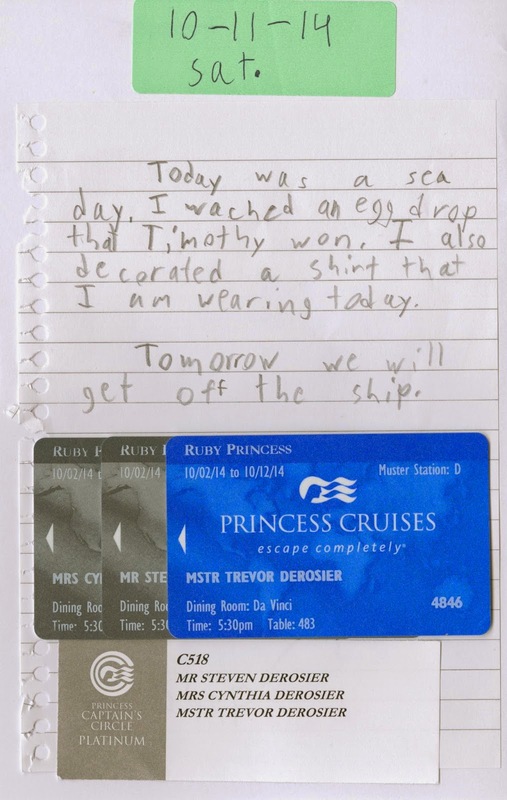 We weren't sure how that was going to go; in the past, Trevor has been eager to spend money right after receiving it. But he did an amazing job of budgeting. 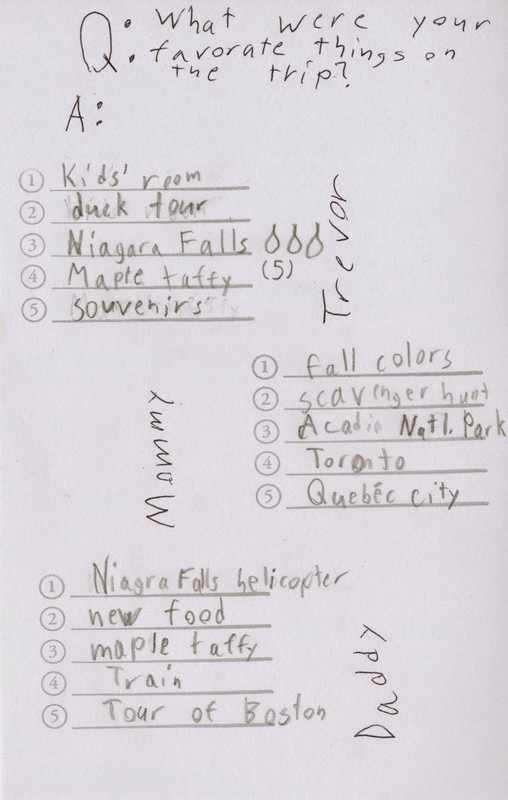 He thought about how many cities we'd be visiting (10, although two ended up being canceled) and decided that he could spend around $8 per city. He thought about every purchase very carefully and made excellent choices. More than once, he commented that he would have bought a particular item if it had cost X, but it was not worth it to him at Y. Here is how he spent his money. 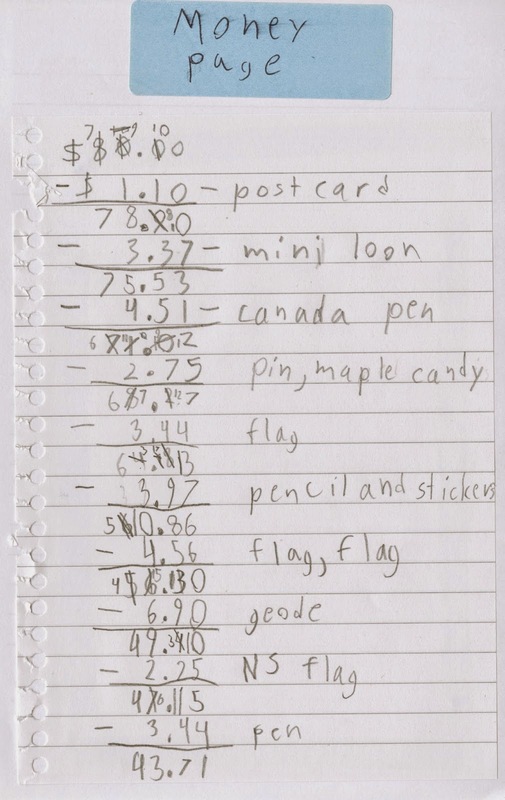 He got a great variety of items, including a postcard to send to his classmates and $2 worth of Canadian nickels to pass out during his class presentation. He came home with $15.93 left over. 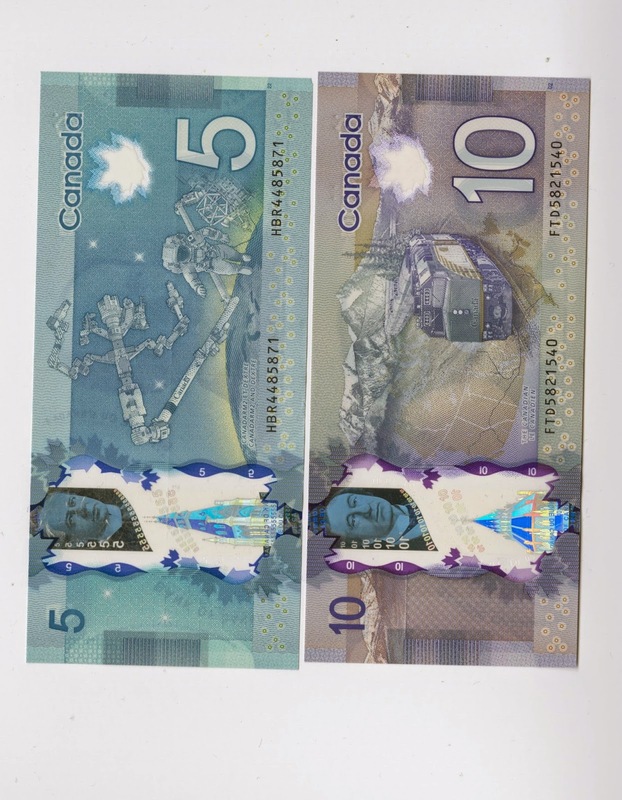 We gave him $10 and $5 Canadian bills to put in his binder. 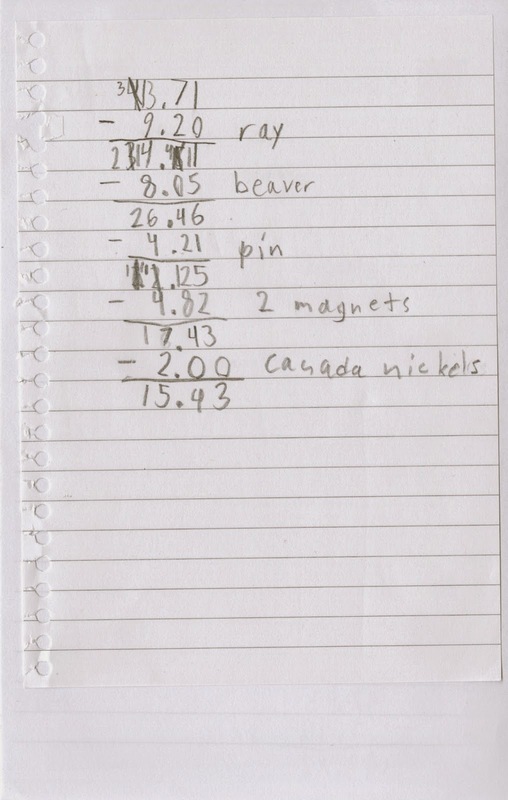 He kept one coin of each denomination to put in his binder as well. I showed him how to sandwich the coins between clear contact paper so that he could display both sides of each coin. Trevor used his Travel Binder to create a slideshow and presentation for his class. He started by dictating everything he wanted to tell his classmates, then we went through the photos together to match them with his text. He did an amazing job. If you'd like to read his text, you can see it here. This was such a wonderful project. 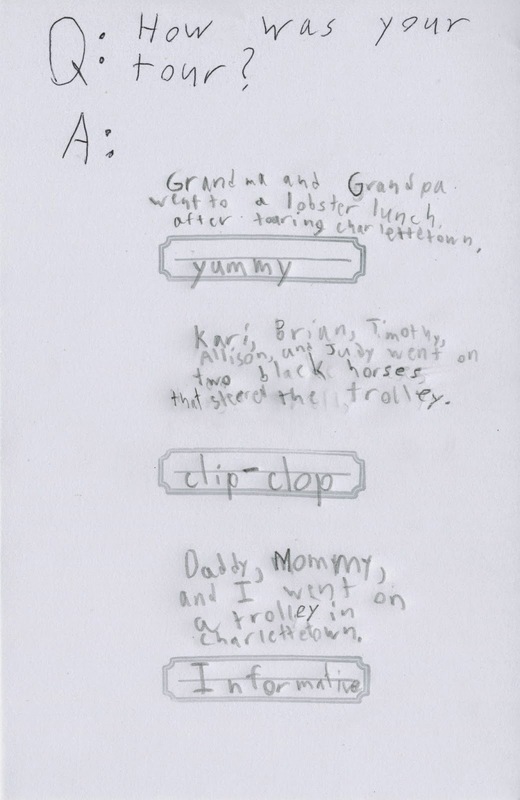 I am so grateful to his teacher for giving him such a creative assignment. Trevor loved doing it and has a record of the trip that he can keep forever. 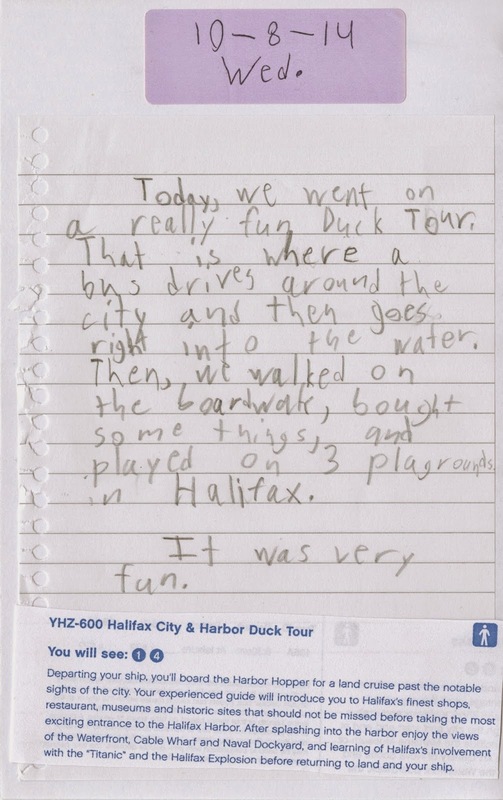 On Wednesday 10/8, we visited Halifax in Nova Scotia. 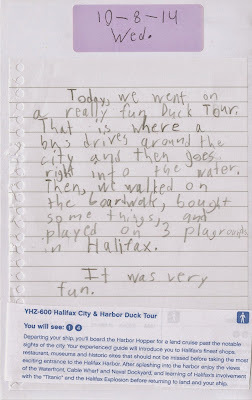 We took a Duck Tour, which was great fun and one of the highlights of the trip for Trevor. We spent the rest of the day exploring Halifax and walking on the boardwalk. The Question of the Day asked, "How was your day?" 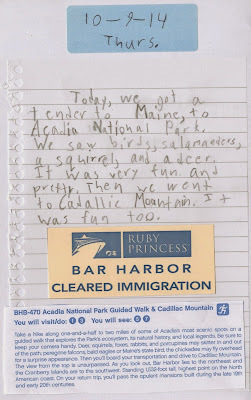 On Thursday 10/9, we went to Bar Harbor, Maine. Because we were returning to the US after Canadian travel, we had to clear immigration first thing in the morning. 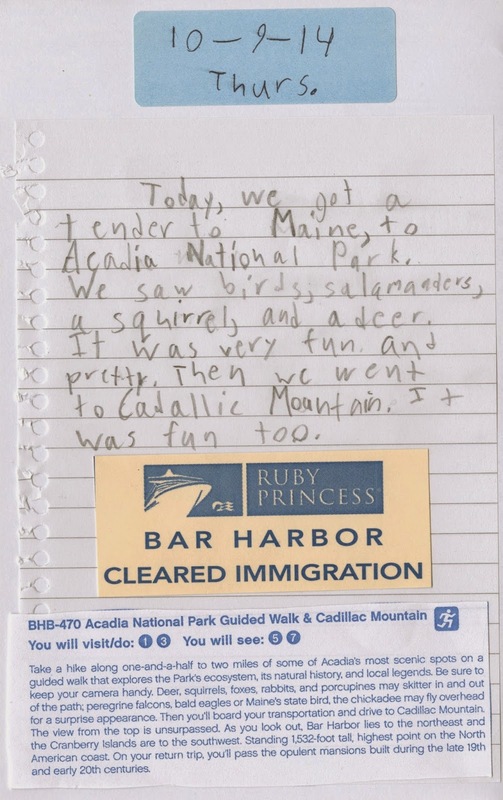 Then we went to Acadia National Park. It was gorgeous. We had a wonderful hike that took us through different biomes. Then we went to the top of Cadillac Mountain. It was a fantastic day. 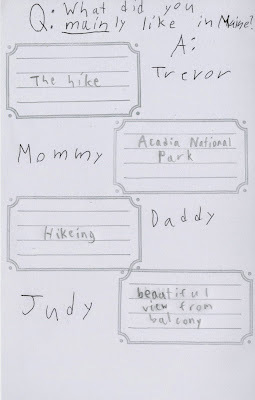 Trevor asked us, "What did you mainly like in Maine?" 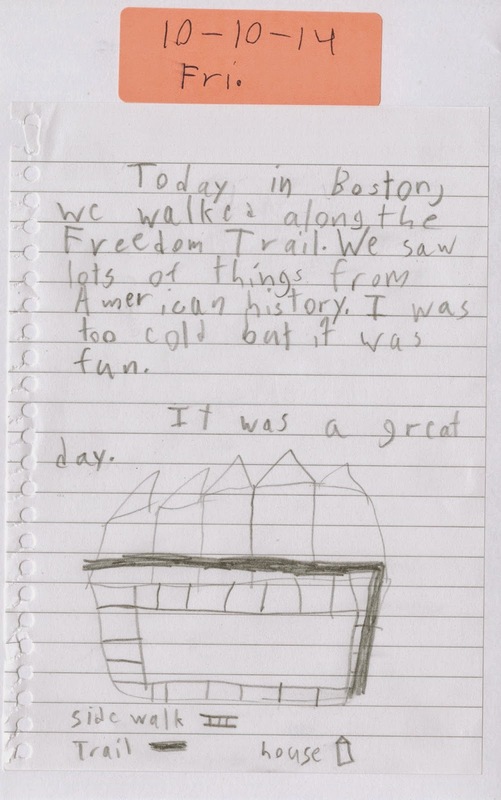 On Friday 10/4, my mom joined Trevor and me for a guided walk along the Freedom Trail while Steve took a culinary tour and the rest of the family went to Fenway Park. 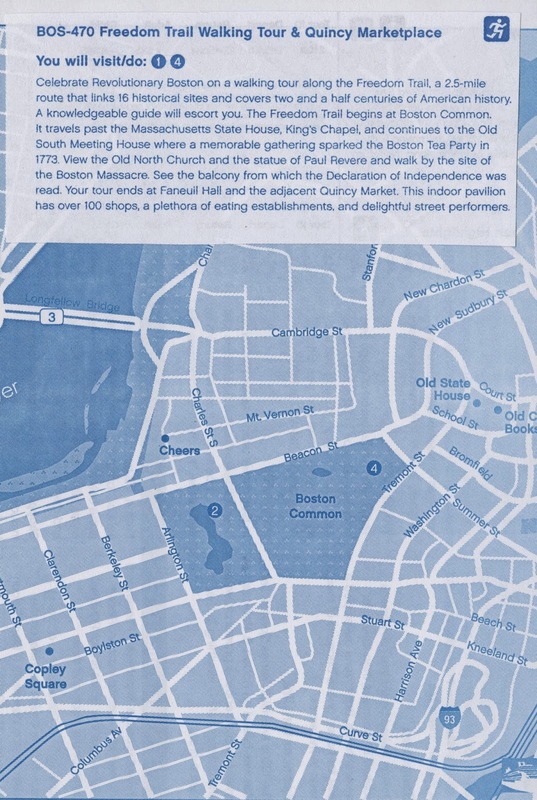 This was my first visit to Boston and I was thrilled to finally be there. I was supposed to have gone with my students in early 2002. 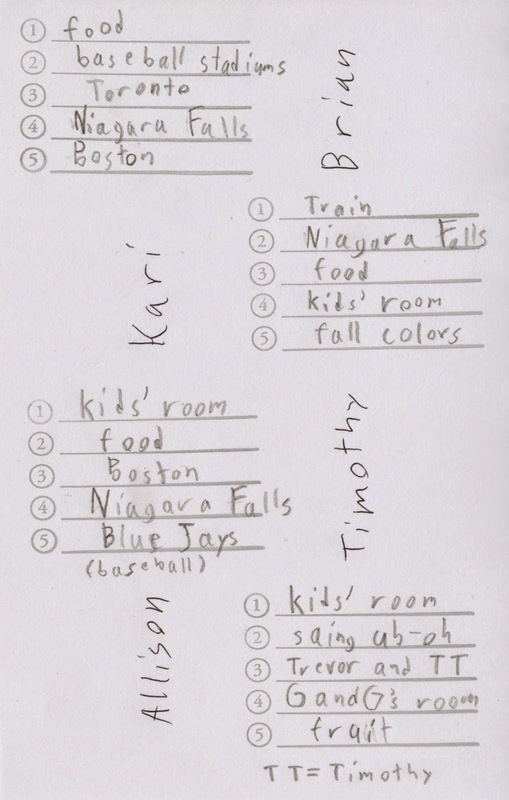 After taking fifth graders on a very successful trip to New York City and Washington D.C., my coworker and I started planning a New York City and Boston trip. 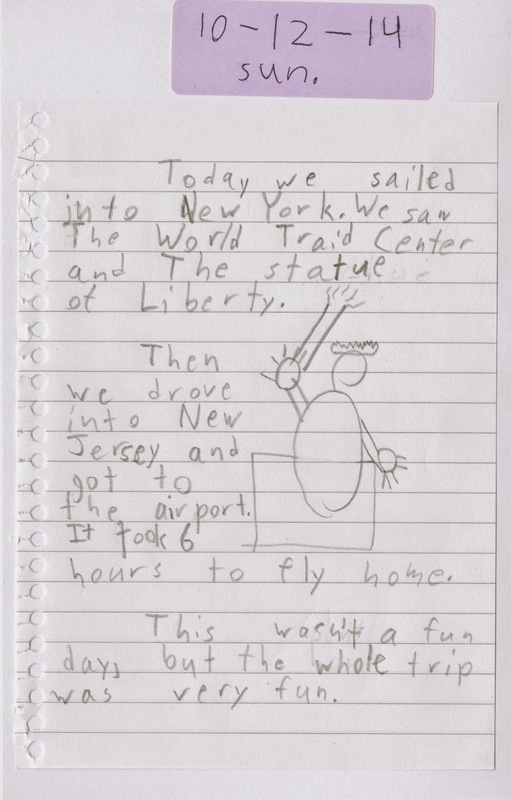 Our itinerary was set and plans were in place, then September 11, 2001 changed everything. Our deposits were due, but we didn't know what air travel would be like in the upcoming months, nor which historic sites would be open. Parents were concerned that it wouldn't be safe to travel, so we canceled the trip. 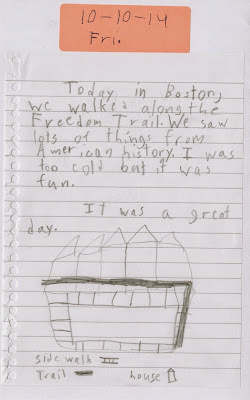 Even though Trevor has not studied American history yet, he was still very interested in everything along the Freedom Trail. 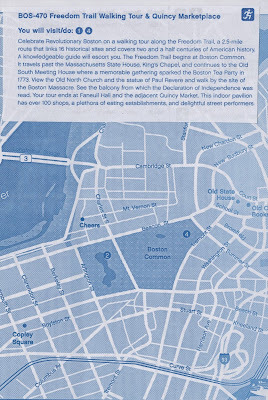 That night at dinner he asked us all, "How was Boston?" 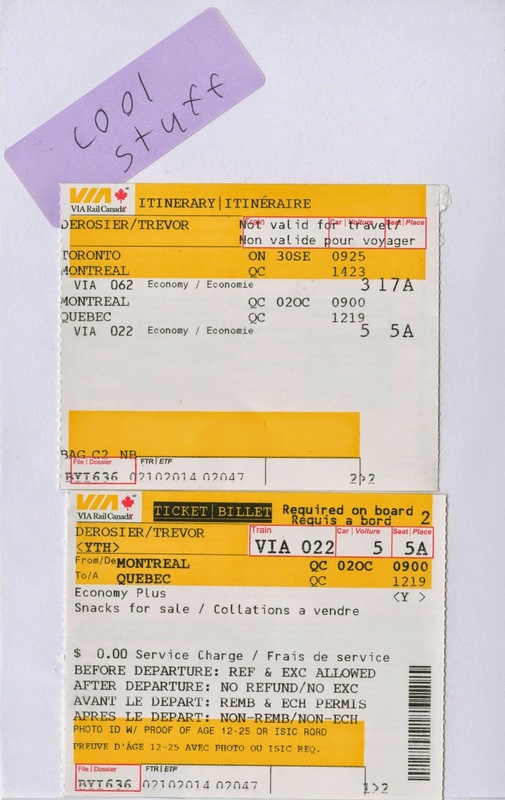 Tomorrow I'll share the last part of Trevor's Travel Binder. On Saturday 10/4, we were scheduled to visit the village of Saguenay. We arrived to clear skies but lots of wind. Our ship was anchored, so we had tender service to the dock. They sent one group ashore before declaring it too windy for safe passage on tenders. The port was canceled and the group brought back as soon as it was safe to do so. 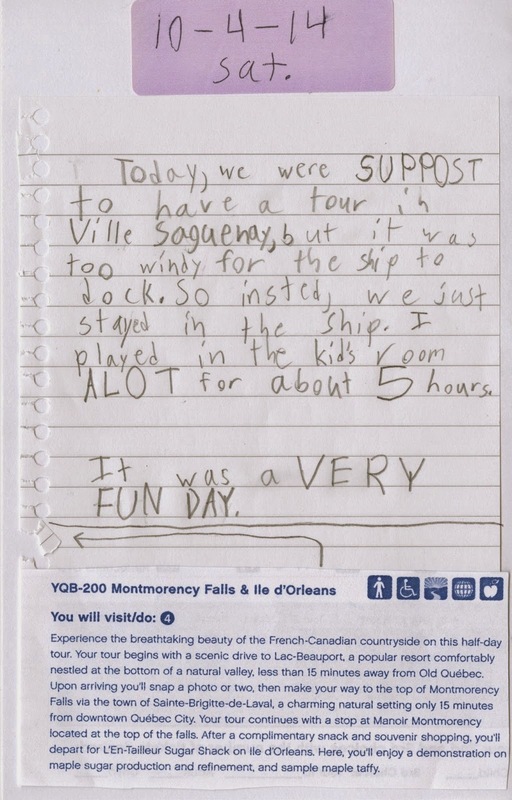 We were very disappointed to miss Saguenay. Trevor and I were planning a hike at Saguenay National Park, while Steve was going to go sea kayaking with my sister's family. But it was nice to have an unexpected day at sea for reading, relaxing, and all the onboard activities. 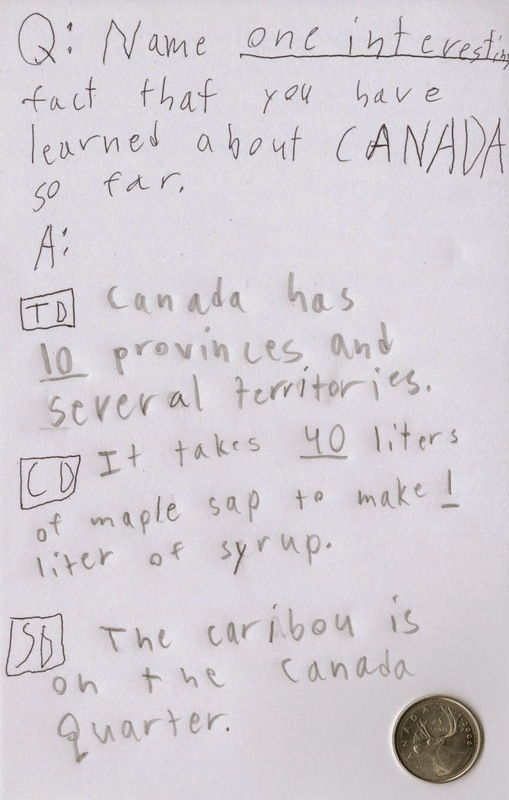 Trevor's Question of the Day asked us to rank Toronto, Montreal and Quebec City from our favorite to least favorite. 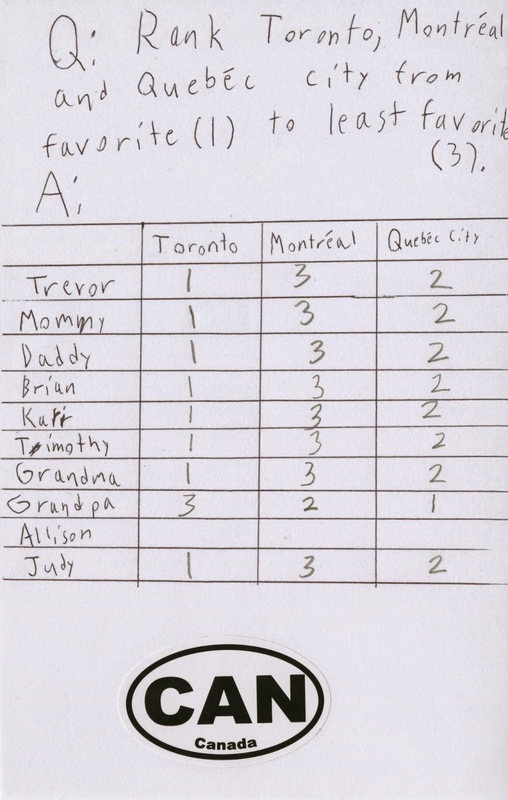 Of the 9 who answered (18 month old Allison was asleep and wouldn't have understood the question anyway), 8 of us ranked Toronto tops, Quebec City second, and Montreal third. My dad was the only one who had a different opinion. 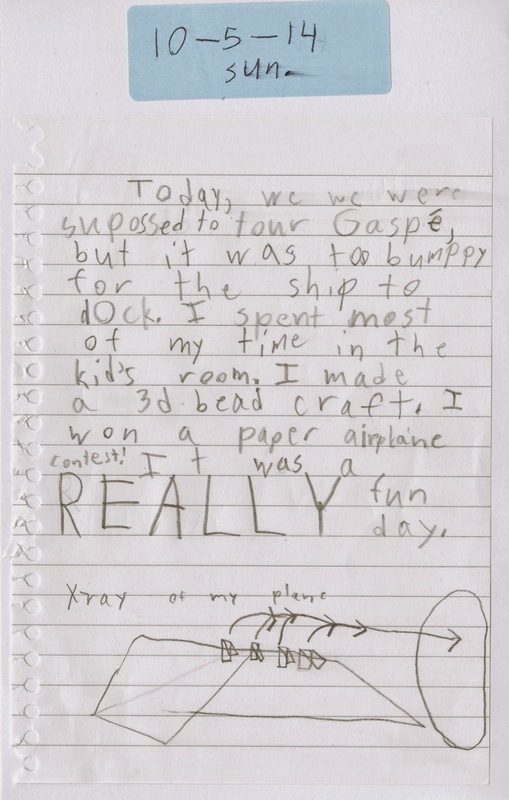 On Sunday 10/5, we were supposed to stop at Gaspe, but once again it was too windy for us to safely get ashore. We'd been planning to visit Forillon National Park, so it was once again disappointing to miss our hike. But the ship really stepped it up with onboard activities to make up for the canceled port. Steve and Trevor both entered a paper airplane contest. Out of the 30+ people who entered, they were the only two to successfully fly their planes from Deck 7 through a hula hoop on Deck 5. 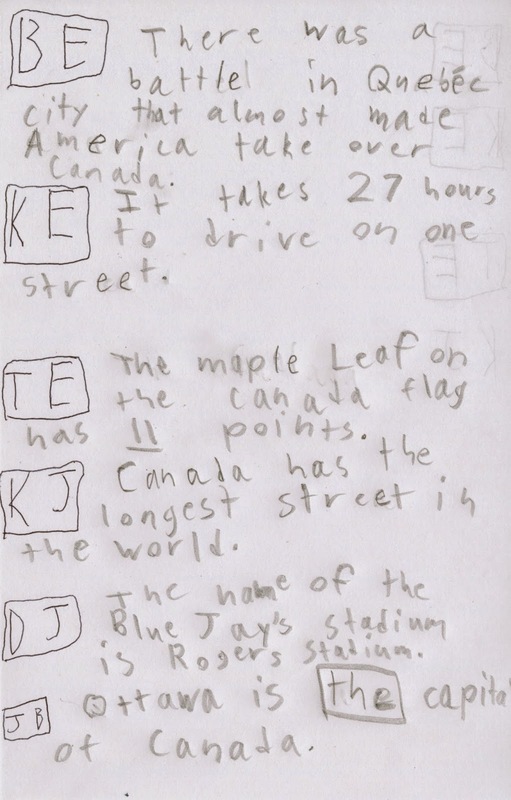 The Question of the Day asked us to each name one interesting fact we'd learned about Canada so far. 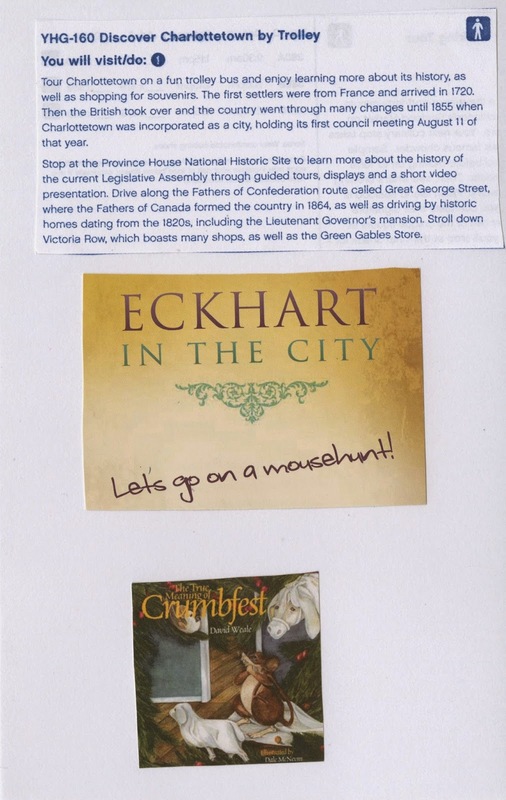 On Monday 10/6, we visited Charlottetown on Prince Edward Island. It was a wonderful city. We took a guided trolley tour in the morning, then spent the afternoon exploring on our own. 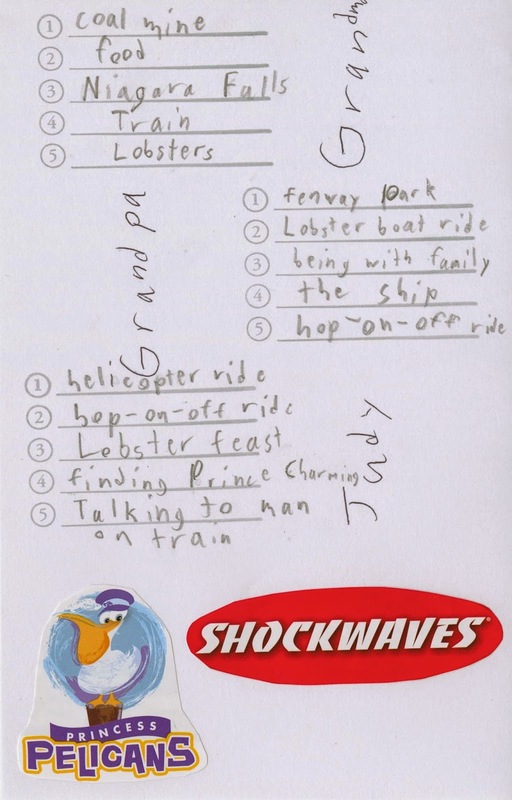 We stumbled on a super-cool scavenger hunt that ended up being a highlight of the trip for us. 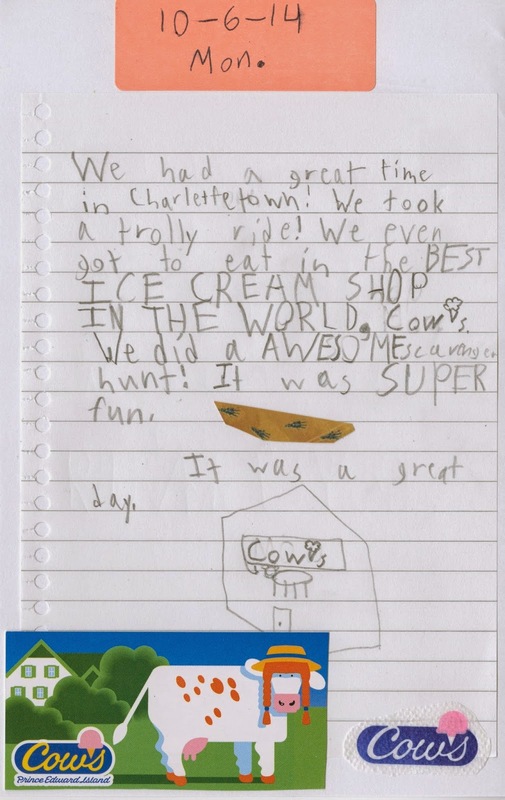 We enjoyed some Moo Crunch and Fluff N Udder at Cow's, an ice cream shop ranked best in Canada and best in the world. Well-deserved, in our opinion. That evening, Trevor asked us "How was your tour?" Our group of 10 people had done three different tours, so we answered in groups. It was great to reconnect in the evening and share our day's adventures. On Tuesday 10/7, we were in Sydney, Nova Scotia. 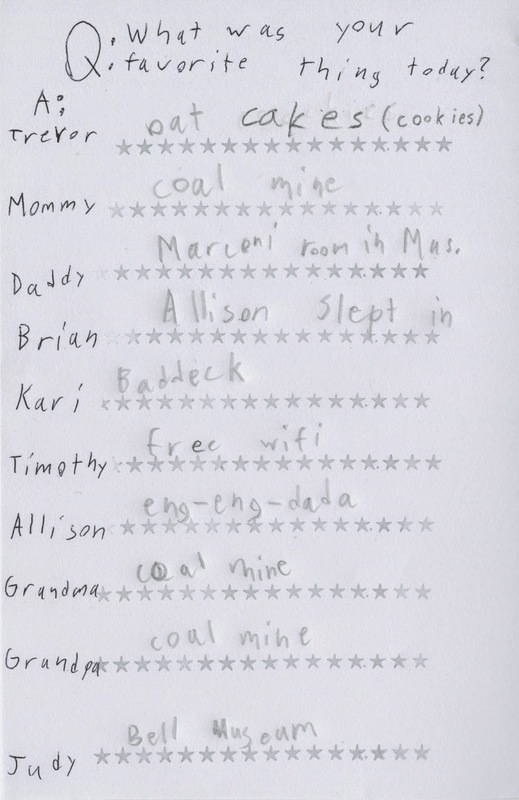 We visited the Cape Breton Miners' Museum. What an amazing tour! 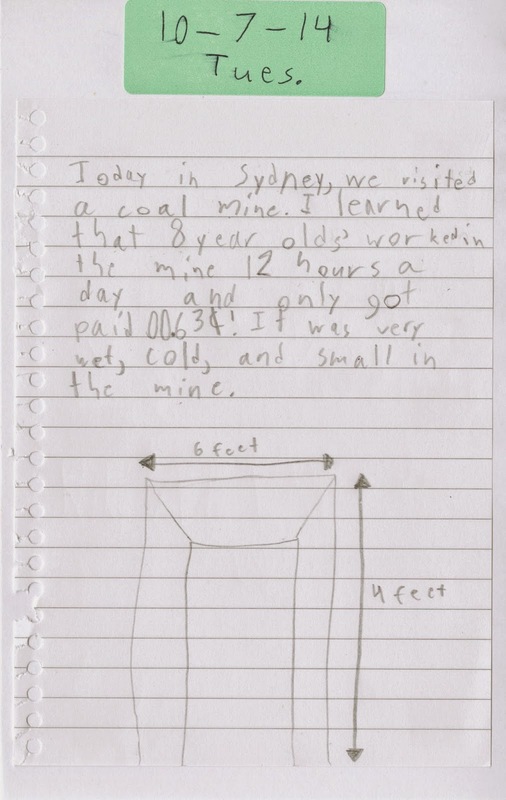 We learned so much from our guide, who had actually started working in that very mine at the age of 8. 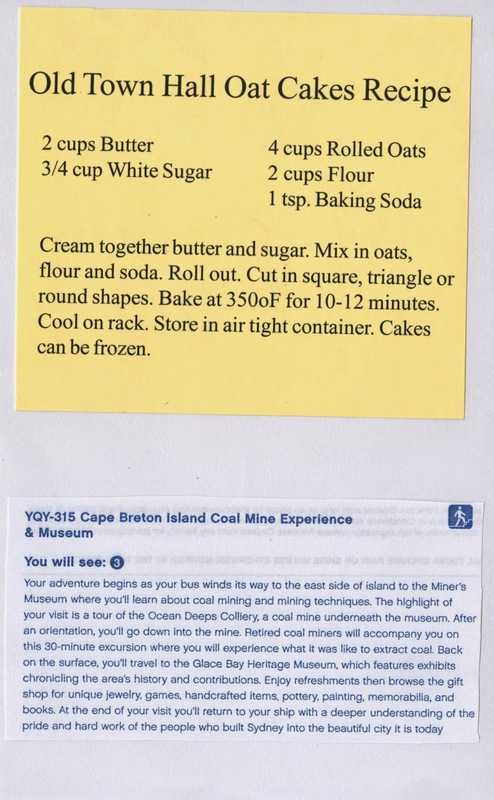 Next, we headed to the Glace Bay Heritage Museum, where we sampled some extremely tasty oat cakes and then enjoyed the museum. Trevor asked each of us about our favorite thing of the day. He really had to think about his answer, since he'd enjoyed it all so much. He decided the oat cakes were his favorite part. 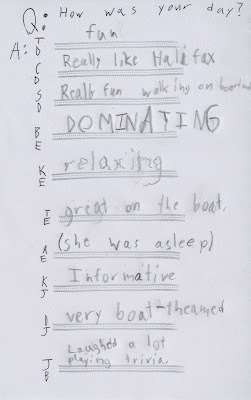 He announced that he wanted to make them for his classmates during his oral report. They were a huge hit. On to Part 4 tomorrow.